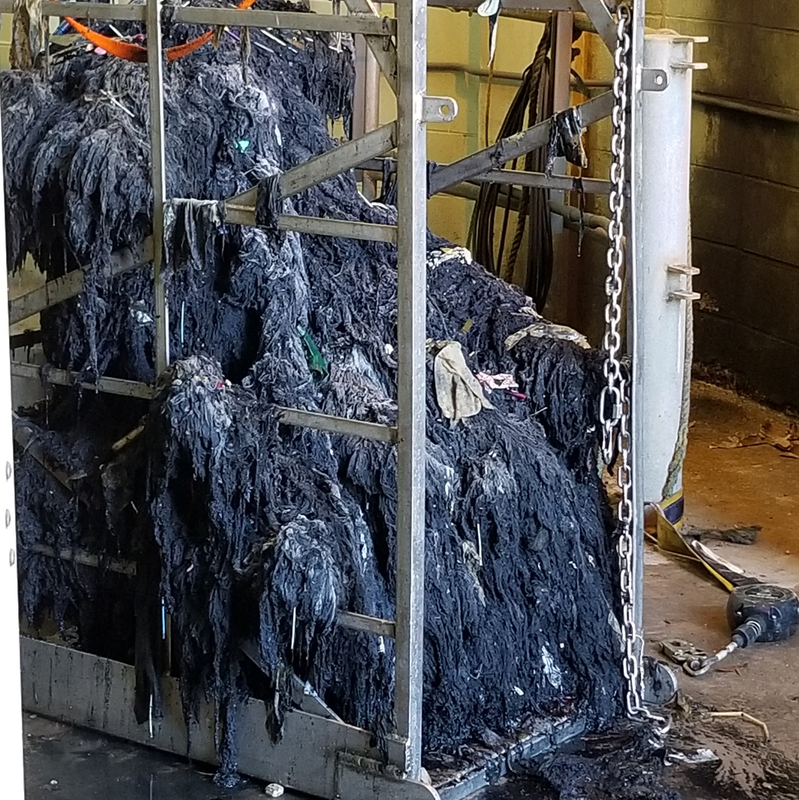 A series of strikingly illustrative photographs from the removal of a massive pump blockage recently brought a spike of public attention to Charleston, South Carolina’s so-called “flushable” wipes problem. After noticing rising levels and determining a blockage was the cause of a backup in one of its 100-foot-deep wet wells, Charleston Water System contracted a diving team to jump in and remove the blockage. By the time a diver entered the wet well, it was nearly full of raw sewage. It took them several dives, each time hauling up a hulking monstrosity of blackened detritus. Captured in photos, those twisted, sewage-soaked masses were shared on social media along with shots of the divers and their apparatus — and the response exceeded expectations. The story ran with an ABC News affiliate and the New York Post, providing a platform to inform the public on a broad scale about the dangers of wipes in collections systems. Sewer divisions don’t usually get a lot of attention unless something bad happens, but this case underlines the benefit of progressive public education and outreach. Though a blocked wet well isn’t good and wouldn’t normally be something a utility wants to draw attention to, the unexpected public interest has helped get the word out about wipes. Four years ago, Charleston experienced a very similar incident, and at that time, it got little attention. So when it happened again, the staff at Charleston Water wasn’t exactly surprised. It’s an issue most in the industry are familiar with — blockages caused by wipes that are marketed as disposable have become a rampant issue in recent years, costing utilities hundreds of thousands of dollars. But this time, the utility’s communications team shared photos from the clog removal dives. Here's a look at a mass of wipes pulled out of Charleston's wet well. Diving 100 feet down into pure raw sewage sounds like an unsettling notion to most outside the industry, but as the divers on this case iterated, it’s just part of the job. But for people outside the industry, the idea created a sensational story. Assisted by a large cable-drawn basket, the diver pulled out the fatberg, pieces at a time, loading them onto the basket to be hoisted back up. All in all, they cleared a mass of wipes approximately 36 inches wide and 12 feet long. “Luckily, our pumps were only about 70 percent blocked,” Saia says. Workers noticed an issue midway through the day on Thursday, Oct. 11. They immediately put out a call to their usual diving contractor, who has worked with the utility for more than 20 years, and had done maintenance on this wet well in the past. “They went in very early Monday morning, 5 a.m., and concluded at about 8 o’clock Tuesday morning,” Saia says. A total of three dives took place over that period. One of the divers was actually on the job four years ago for the previous incident. The utility is discussing improved maintenance options, but it’s difficult because they can’t monitor the buildup of wipes — they believe the mass actually migrated from further down the pipe, and did not accumulate in the wet well itself. This makes management of fatbergs and wipe buildups difficult, something most utilities across the nation can relate to. “It costs us about $200,000 a year to perform our wastewater collections maintenance program, and the majority of those dollars are due to wipes clogging our pump stations at various stages,” Saia says. Fortunately for Charleston at least, the problem may end up mitigating itself as they embark on a new tunnel project scheduled to go online early next year. As it is, the blockage of this wet well required three bypass pumps to avoid serious overflows and maintain service. The new system will be much more flexible. “The new tunnel also comes with a series of new pumps and tunnels — interconnectivity that provides redundancy across our pumps,” Saia says. “We’re probably in good shape to get us from between now and that point, but there are operational decisions that haven’t been made yet. Basically we expect things to become a whole lot better in the next six months, and we may not have to maintain our existing infrastructure.” As for public outreach, though they never intended or expected this story to go viral, getting the word out about wipes will continue to be priority for the industry moving forward. Social media posts like those Charleston has put out are important to that effort, showing citizens a close-up look at the problems wipes can cause.